We feel that friendliness, sincerity, and a desire to help are the basis of good banking relations. Our officers and staff will accommodate you in all your banking needs. Please explore our website and email, call, or stop in to see us soon! 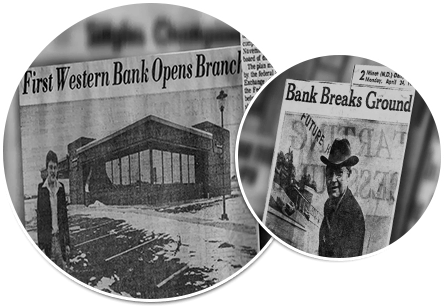 First Western Bank & Trust strives to be the premier bank and financial service provider in the communities we serve by building strong customer relationships, providing great customer service, offering diverse financial products and maintaining knowledgeable, friendly, professional employees. We take pride in the communities we serve and value the importance of giving back through charitable works. Our employees are actively involved with our service projects, sponsorships and worthy causes.